Love it! With three daughters, we’ve often had a lot of people in and out of our house. Sometimes I’d worry about Alexa slipping out. After all, what if one of my daughter’s friends didn’t know she was exclusively a house cat and accidentally let her out?! The thought gives me nightmares. Fortunately, my girls have always been GREAT about telling each one, “That’s Alexa. She’s spoiled rotten and cannot ever go outside.” We’ve never had a single misstep. We’re also lucky that Alexa never tries to get out. She knows she has a great thing going here and doesn’t attempt to rock the boat. The only time she even approaches the door at all is one of us is returning home. The tin sign shown above would serve as a great reminder for houses with pampered babies that MUST stay indoors – it’s also incredibly cute! Click through for a closer look. Cat lovers, here’s something you’re going to get not just a kick out of, but a high kick. If you want to see what happens when animal lovers happen to have an unreal amount of artistic ability, you have to check out Pet365. 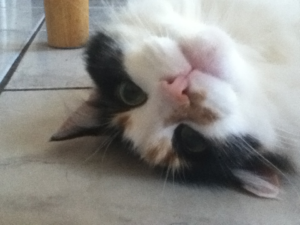 Click through the adorable link below and take a FUN look at cat anatomy. You and your cat are going to love this. Cat Anatomy graphic created by Matt Beswick for Pet365. Click below to see the full size version. Too cute! Alexa’s in love with the cat in this art print. He’s cute, enterprising, and can supply her with endless ice cream. The last one sealed the deal. Guardians of Being is a book that I know every pet lover in the world will fall in love with. If you love cats, you’ll absolutely delight in this adorable book. The author, Eckhart Tolle, is probably best known for his wonderful book The Power of Now: A Guide to Spiritual Enlightenment . As for the illustrator Patrick McDonnell? Oh, he’s only the creator of the comic strip that Peanut creator Charles Shultz called “One of the best comic strips of all time.” – MUTTS. And he’s an amazingly talented individual! What I love most about Patrick McDonnell’s work is how amazingly obvious it is that he doesn’t just love animals, he GETS them. The smallest of details in his illustrations show what the dog or cat is thinking and the rest of us who love our pets to distraction identify with his drawings. Not only will all cat lovers (and dog lovers!) want to buy a copy of Guardians of Being right away, I’m sure you’ll want to buy a copy or two for loved ones. This is a very, very special book. Absolutely Gorgeous Art Print for Cat Lovers: Tea Time with Fuzzy! Without a doubt, this is one of the most beautiful art prints I’ve seen in a long time. Granted, I love cats like crazy and I’m something of a tea addict, but I’d love this even if I had a cat phobia and never met a tea I liked. This one’s just stunning. Click through the image to take a closer look. Sigh. I think I want one in each room of my house. Extreme, right? Fellow cat lovers, here’s a book you’ll want to add to your collection immediately, if not sooner. Tabitha: The Story of a Much-Travelled Cat is a gorgeous little book starring an even more gorgeous cat. Her name is Tabitha and she has more resilience than a lot of humans. Like all cats, Tabitha loved to lie in the sun. 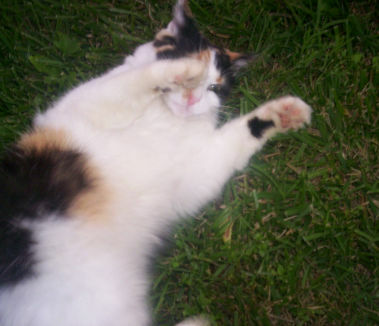 She would stretch out on the patio or in the sun-room, and roll over onto her back, displaying the soft, light-brown, dark-spotted fur along her tummy. When she could, she made her way upstairs and settled on her mistress’s bed. She would wait for her mistress to come home from work, and would soon be curled up on her lap, purring, while Jane enjoyed a cup of tea. Tabitha’s memoirs were lovingly written by her grandmother, author Helen Harris. The beautiful photographs throughout the book were lovingly taken by Tabitha’s mother, Jane Tirard. This absolutely precious book is a must-have for all cat lovers. You’ll adore every second of the fast-reading tale almost as much as you enjoy the pictures of Miss Tabitha. Since we cat lovers are sensitive people, I thought I’d set your mind at ease right up front – there is, thankfully, no sad ending involved. I thought you’d like to know because, if you’re anything like me, you avoid sad-ending animal stories with every ounce of your being! 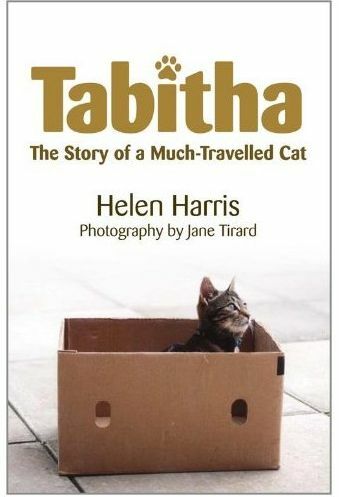 Tabitha: The Story of a Much-Travelled Cat is definitely a feel-great book and I hope you’ll grab a copy right away. Fuddles: One Adorable Cat with a Story to Tell! Meet Fuddles! He’s a much-loved – and no doubt very pampered – beautiful cat who’s becoming a star. Hopefully he won’t let it go to his head. He’s Frans Vischer’s baby. Mr. Vischer, in addition to being a proud father to 3 without fur and one with, is a Disney animator. How unbelievably cool is that? Frans says that observing Fuddles funny behavior inspired him to make his first picture book, Fuddles, which will be published by Simon & Schuster on May 3rd. He also animated the book-trailer above. To read more about Fuddles and Frans, you’ll want to visit www.fuddles.net. I absolutely can’t wait to get my hands on a copy of this book. Alexa has worked up something of a crush on Fuddles. She loves a cat who appreciates good food the way she does and, by all appearances, Mr. Fuddles knows his way around the food dish. Fuddles is available for PRE-ORDERING on Amazon. I’ve pre-ordered lots of books (and even dvds) on Amazon before and it works like a charm. As soon as the product is available – they send it right to you. I love it because it’s in your hands before anyone else really even knows about it. What can I say, that sort of thing sends me. I’ll also put a link on the side of the website, so you can remember to order the book anytime you decide to. As a fanatical cat lover, I personally collect cat items (art prints, figurines, books, etc.) and can’t wait to add this to my collection. No doubt you feel the same way. Ahhh, cat people. We’re amongst the most passionate people on the face of the earth. But then again, given the objects of our affections, how could we not be? Click HERE to order Fuddles on Amazon today. I was recently sent a wonderful, wonderful, wonderful book to review for my websites titled Lessons from Stanley the Cat: Nine Lives of Everyday Wisdom . This warm, funny, and very thought-provoking book was written by Jennifer Freed as a tribute to her beloved cat (a real character if there ever was one!) Stanley. Not only is the book a beautiful account of a very special little cat and the love he had for his human… and vice-versa… Lessons from Stanley the Cat: Nine Lives of Everyday Wisdom also serves as a self help and self improvement book, offering countless tips and lessons. The little book will become one of your favorites instantly – you’ll fall in love with the illustrations, the author, and most certainly Stanley. Seduction is just the practice of artful stretching. Never let people know how fast you are. Appear slow in all things, and less is expected of you. When someone is on the computer too long, help them by distracting them, or walk lightly on their keyboard.So advises Stanley, a remarkably astute cat with a keen eye for the important things in life. Perhaps you don’t have time for yoga, can’t afford therapy, or wouldn’t dare cry to mother. If so, let Stanley be your guide. Lessons from Stanley the Cat offers wise and witty maxims from Stanley himself, translated by his doting psychotherapist (human) parent, Jennifer Freed. Whether you’re a cat lover or prefer companions of the canine variety, Stanley’s warmth and insight are sure to brighten even the grayest days. Dr. Jennifer Freed is a psychotherapist, a radio show host, and a professor. She lives with her family in Santa Barbara, California. You can learn more about Jennifer at www.jenniferfreed.com. Tone Gellerstedt is a journalist and a graphic designer. She lives with her fiancé, Jonas, and their daughter, Lo, in Uppsala, Sweden. She works at her local paper and publishes books and artwork for her company, Artelligens. I’d strongly urge you to buy several copies – one for yourself and one or more for the cat lovers on your gift list. This little book (costing just a little over $10) is the ideal book for a cat lover to have in their book collection. After all, we cat lovers love few things as much as fellow cat lovers – other humans who revere and love their cats as much as we do our’s. The author of Lessons from Stanley the Cat: Nine Lives of Everyday Wisdom ? Make no mistake about it, she’s our kind of people… cat people. Click HERE right away and order your copies today. Act now and you’ll have Stanley’s lessons in time for Christmas! Cat Lovers, Check Out Catios! My husband, and father of our cats, e-mailed me this great article this morning. It’s always, always, always warm and wonderful to see other people who love their pets to distraction and back, too. I could give a little background or set the stage, or patio as it were, but it’d be best if you read – and saw – firsthand what these cat lovers have done for their pampered babies. Absolutely Adorable Collectible for Cat Lovers! Gorgeous! The beautiful collectible above is Wake-Up Call Fun Cat & Bird Tree Figurine: Unique Cat Lover Home Decor from Collectibles Today. If you collect cat figurines (as well as live cats now that I think about it!) like I do, this is one you’ll want to add to your collection right away. Uh-oh, there goes the neighborhood! You’ll be delighted by this “purr-fectly” adorable collectible cat and birds tree figurine. Hand-cast of fine artist’s resin, this remarkably detailed figurine depicts a sleeping cat using the roof of a neighbor’s birdhouse as a makeshift mattress. Shh, don’t wake the snoozing feline in this fun cat lover figurine, available only from The Bradford Exchange. This cute-as-can-be cat and birds tree figurine is expertly hand-painted, from the bright red cardinal and bluebird in the tree, to the green grass and purple flowers below. Makes unique cat lover home decor. Strong demand is expected, and you won’t want to miss out. Order now! Click through for more information and to claim your own beautiful Wake-Up Call Fun Cat & Bird Tree Figurine: Unique Cat Lover Home Decor .